Fill out the short online credit application. No need to decide on a floor coating system just yet. After completing your online application one of our representatives will contact you via phone to complete your application process. A credit decision will be made right away for your convenience. Once approved, we will provide you with your personal account number (keep safe for later use) that you can then use when you place your order with your representative. *Offer applies only to single-receipt qualifying purchases. No interest will be charged on the promotional purchase if you pay the promotional purchase amount in full within the promotional period which may be 6, 12 or 18 months. If you do not, interest will be charged on the promotional purchase from the purchase date. Depending on purchase amount, promotion length and payment allocation, the required minimum monthly payments may or may not pay off purchase by end of promotional period. Regular account terms apply to non-promotional purchases and, after promotion ends, to promotional balance. For new accounts: Purchase APR is 29.99%; minimum interest charge is $2. Existing cardholders should see their credit card agreement for their applicable terms. Subject to credit approval. 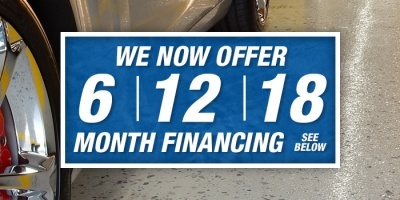 We reserve the right to discontinue or alter the terms of this offer at any time.